Volvo has unveiled a new version of its recently launched V40 hatchback - the Cross Country. Volvo has stopped short of calling it an XC, as the majority of models are actually only front-wheel drive, rather than 4x4. However, the V40 Cross Country does get a more rugged look with silver underbody protectors, black lower bumpers and roof rails. While it's far from being an off-roader it does have 40mm higher ground clearance. Top T5 models also have Hill Descent Control, which maintains the car's speed when driving down steep inclines. However the T5 is the only version with four-wheel drive and it's unlikely to be especially cheap or economical with an average of 34mpg. There is a T4 petrol, a 1.6-litre engine with 180PS maximum torque of 270Nm. Fuel consumption is 51mpg with CO2 of 129g/km. However, the diesel versions will be more affordable to run. The D2 has a 1.6-litre diesel engine with 115PS that averages a claimed 74mpg with CO2 emissions of just 99g/km meaning zero annual VED while there's the D3 with 150PS and 350Nm of torque. The top diesel is the D4 five-cylinder 2.0-litre engine with 177PS and like the rest of the diesel engines comes with a six-speed manual as standard with a six-speed automatic as an option. Start/Stop is fitted as standard along with with Bluetooth, City Safety and the V40's world-first pedestrian airbag. 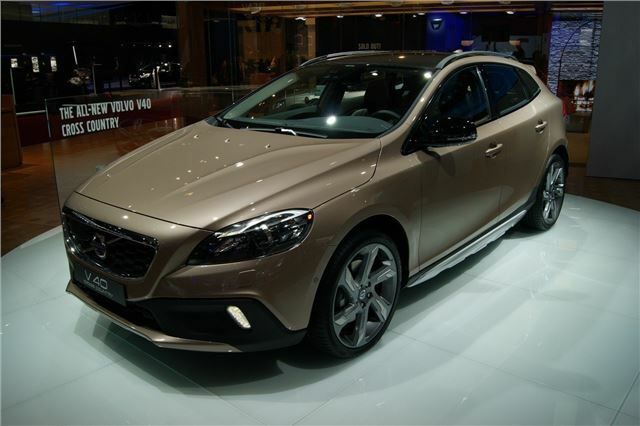 The new V40 goes on sale in January 2013 and prices are expected to start at around £19,500.